The complex of the rock cut cave temple has the colossal hillock as back-drop. The complex consists of a rock-cut shrine with structural mandapas in the front and two other structural shrines. 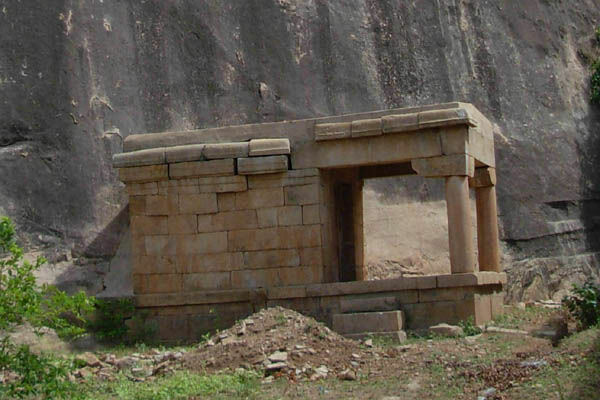 The rock cut cave temple is scooped at a considerable height on the eastern precipice of the hillock and houses the deity Thirumerrali Mahadevar and the structural shrine on the south houses Malaiyamangai or Soundaranayagi Amman and the shrine on the north houses Ganesa. Beyond this a giant bas-relief sculpture of Ganesa, the musical inscription, inscriptions of Cholas are also found on the rock face of the hillock. 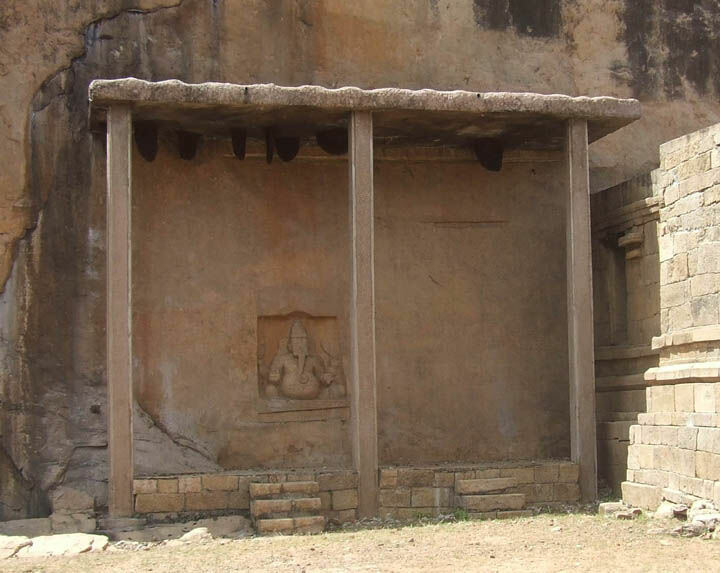 Musical inscription and the Ganesa relief sculpture are protected by a shelter constructed by the ASI. 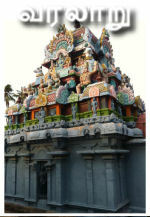 The structural shrine of goddess Malaiyamagai or Soundaranayagi Amman is situated to the south of the rock cut shrine. The inscriptions mention the deity as Aruvudai Malaimangai and it was consecrated by one Devadasi Umayalvi Nachi, daughter of Thugaiyandi during C.E. 13th century.6 The inscription which is on the southern wall of the shrine further gives us information that the village Melmananallur was gifted by Jatavarma Sri Virapandya I while he was present at Karaiyur in Konadu division to Malaiyamangai Amman which was consecrated by Umayalvi Periyanachi. The shrine consists of a mukha mandapa, ardhamandapa and a sanctum. The entire structure has a padabandha adhishthana, bhitti and prastara. The bhitti is adorned by vishnukantha pilasters which also possess upper ornamentation. In between the adhishthana and the bhitti is seen the vedika component. Niches are shown on the three sides of the sanctum walls viz., west, north and south, but are empty. The tala ended with bhumidesa. The mukha mandapa is a closed pillared structure with opening on three sides viz east, north and south. The openings on east and north possess steps flanked by parapet walls whereas the southern opening lacks steps. The ardhamandapa is a small passage which leads us to the sanctum. The sanctum houses the goddess in standing posture. The deity is standing in sama in a pedestal and clad in pattadai, jatamakuta and ornaments. The front hands are in abhaya and varadha whereas the back right hand holds nilothbala and the left hand holds the lotus. The Ganesa shrine is situated to the north of the mandapas in front of the rock cut shrine. The shrine has a sanctum and a porch facing east. The deity is seated on a pedestal in maharajalilasana with motaka and tusk in the front hands and pasa, angusa on the back hands. The deity is adorned with karandamakuta and other ornaments. The musical inscription7 and the Ganesa are on the eastern precipice of the hillock to the south of the rock cut cave. The Musical treatise is in Sanskrit and written in Pallava Grantha begins with ‘Siddham Namah Sivayah’. It is divided into seven sections corresponding to the seven notations on musical scale and each section consists of a collection of group of four notes arranged in sub sections of sixteen. Each section has heading on the left margin usually at the top. At the end of the musical inscription both Grantha and Tamil inscriptions are seen. The Grantha portion reads as ‘composed or made by the king, who is a great devotee of Mahesvara or Siva and who is a disciple of Rudracharya,8 for the benefit of learners’. The Tamil inscription reads as ‘these are common to eight or seven’. 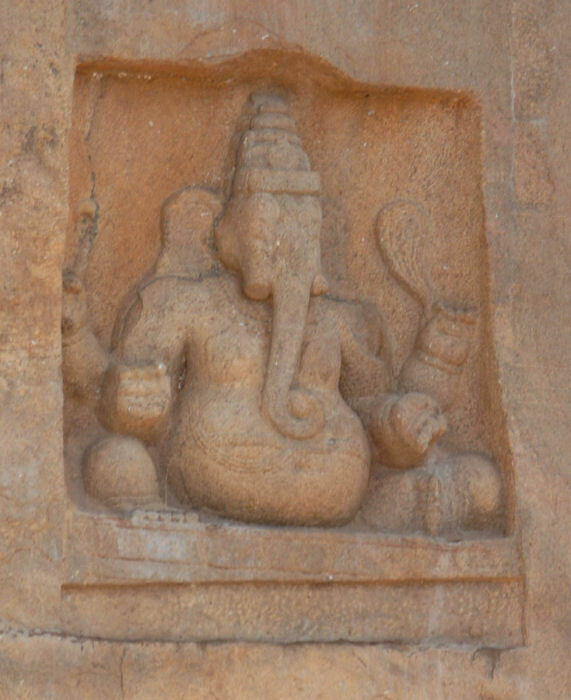 The giant bas-relief Ganesa is found on the eastern precipice of the hillock to the south of the musical notations.9 The deity is carved inside a square niche seated above partially finished lotus pedestal. The deity seated in maharajalilasana with his front right hand holding the tusk and the front left hand holding motaka whereas the back right hand is holding the angusa and the left hand pasa. Udarabandha, charapali, bangles are the ornaments adorned by the deity. Yajnopavita is worn in upavitha fashion. 7. IPS (Translated into English) Part I P.3-10. 8. ibid., சு.இராசவேல், அ.கி.சேஷாத்ரி, 'சப்தமாதர்களின் சிற்பங்களும் புகழ் பெற்ற இசைக்கல்வெட்டு இயற்றிய உருத்திராச்சாரியார் பற்றிய குறிப்பும் இக்குடைவரை மாகேசுவரர் பிரிவைச் சார்ந்தது எனக் கட்டியம் கூறுகின்றன'. P:172. The authors wrongly stated that the musical inscription is written by Rudracharya. It is stated in the inscription as written by the disciple of Rudracharya. Saptamatha sculptures are found nowhere in the temple. The authors didn’t clearly state that in what way the presence of Saptamathas sculptures and description about Rudracharya define the cave as Maheswara faction. 9. ibid., K.V.Soundara Rajan, ‘…… proper right is a Ganesa niche and correspondingly on the proper left, at a distance, is a shine for the seven mothers.’ P.83. Shrine for seven mothers is found nowhere in the complex.